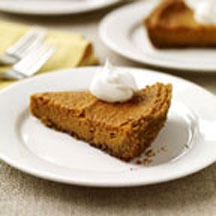 Go ahead, indulge and enjoy this healthier take on a holiday classic—pumpkin pie! For Crust: Place graham crackers and light brown sugar in a food processor and process into crumbs (or smash into crumbs in a sealed plastic food bag with a rolling pin). Spoon crumbs into a small bowl; add melted butter and combine with fingers into a coarse meal. Distribute crumbs evenly on bottom and up sides of an ungreased 9-inch pie plate. Chill for 30 minutes before baking. Bake until crust starts to turn golden, about 8 to 10 minutes; remove from oven and let cool. For Filling: In a large bowl, using an electric mixer, whip egg whites until frothy; fold in egg, dark brown sugar, salt, pumpkin pie spice and evaporated milk. Beat pumpkin custard until smooth and pour into pie shell. Bake until a knife inserted in center comes out clean, about 45 to 55 minutes. Slice into eight pieces, top each piece with 1/2 tablespoon of whipped topping and serve warm or at room temperature. Recipe and photograph provided courtesy of www.Weightwatchers.com; through ARAcontent.